There are 24 Trithankaras in Jaina and all of them Kshartiyas. 24th Tirthankara was Vardhamana Mahavira himself whose symbol was Lion. In the search of truth, Mahavira became an ascetic at the age of 30. He kept on wandering for 12 years from place to place. At age of 42, he attained Kaivalya(perfect knowledge or supreme knowledge and final deliverance on the bank of river Rijupalika under a sal tree. Mahavira got acclaimed as a tirthankara, a kaivlya (supreme omniscient), a jina(conqueror) and an arhant(blessed one). He propagated Jainism for 30 years and his mission tool him at to Kosala, Magadha, Mithalam Champa etc. He passed away at the age of 72 in 468 BC at a place called Pawapuri near modern Rajgir . He became the head of a sect, called nirgranthas, who later came to be known as Jinas. Mahavira believed in Karma and transmigration of soul, according to him, universe is a product of nature. He also rejected the authority of the Vedas and Vedic rituals. Jainas believed inthe daulistic principle of jiva(eternal soul) and ajiva (eternal element) everywhere. The Jiva acs and is effected by acts. it is a knowing self. The ajiva is atomic and unconscious. According to him every object is an agglomeration of ajjiva, with at least jiva enmeshed in it. They believe non-living substance also possessing life which shouldn't be thus animals were believed to have three or ore jivas. Jainism believed the entire world to be animated, including stones, rocks and even water. Asceticism and penance were two pre requisites for freeing oneself from the cycle of birth and rebirth. Amhinsa(Non-Violence) means cause no harm to the living beings. Satya(Truthfullness) means always speak 'the truth'. Asteya not to possess anything which isn't willingly offered. Brahmacharya (celiacy) to exercise control over one's sense and to keep them free from indugence. Aparigraha(Possession) to observe detachment from peoples, place and material things. Jainism rejected the authority of the vedas and the vedic rituals. World was not created, maintained and destroyed by a personal God. Doesn't believe the existance of God. Believe in Karma and transmigration of soul. Right Conduct include the fullfilment of the 5 vows of Jainism. Jains are divided into two major sects; the Digambara (meaning sky clad) sect and the Svetambara (meaning white clad) sect. Each of these sects is also divided into subgroups. The twelve angas of Jainism include. Purpose of this council was to collet the sacred texts and write it systematically. Resulting final compilation of 12 angas and 12 upangas. 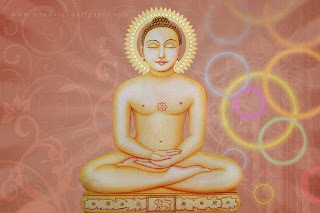 Mahavira organised the Sangha to spread his teachings. He admitted both men and women in the Sangha, which consisted of both monks and lay followers. The rapid spread of Jainism was due to the dedicated work of the members of the Sangha. It spread rapidly in Western India and Karnataka. Chandragupta Maurya, Kharavela of Kalinga and the royal dynasties of south India such as the Gangas, the Kadambas, the Chalukyas and the Rashtrakutas patronized Jainism. By the end of the fourth century B.C., there was a serious famine in the Ganges valley. Many Jain monks led by Bhadrabagu and Chandragupta Maurya came to Sravana Belgola in Karnataka. Those who stayed back in north India were led by a monk named Sthulabahu who changed the code of conduct for the monks. This led to the division of Jainism into two sects Svetambaras (whiteclad) and Digambaras (Sky-clad or Naked). The first Jain Council was convened at Pataliputra by Sthulabahu, the leader of the Digambaras, in the beginning of the 3rd century B.C. The second Jain Council was held at Valabhi in 5th century A.D. The final compilation of Jain literature called Twelve Angas was completed in this council. Various factors are responsible for the decline of Jainism in India. Their indulgence in weird practices like not taking medicine even ill and in not plucking vegetables etc, confused the local a lot. Bimbhsara and Ajatshatru helped his religion in many, no king of the later dynasties extended help in its spread. Also Jainas did not make any efforts to spread their religion. Thus the Movement remained unnoticed. The Jainas. opted for Prakrit, through at different places, text were written in the local languages as well. Mahavira himself preached in Ardha-Magadhi. Secondly, the Jaina philosophy has certainly enriched the Indian thought.